Salvatore Torre first appears in the Painesville, Ohio, area in in 1913. 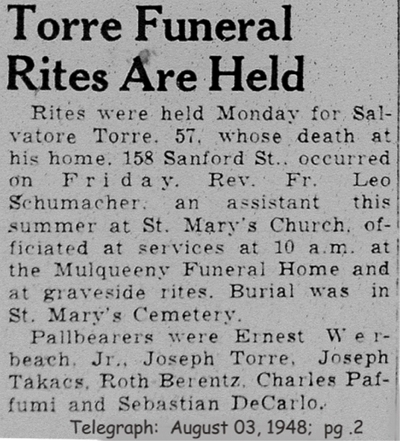 In America, Salvatore Torre was known as Salvatore Torre. Salvatore Torre, son of Giuseppe Torre and Nunzia DiCarlo, was born on December 24, 1890, at Novara di Sicilia. He married Antonia Giuseppa Torre, daughter of Nunzio Torre and Giuseppa Puglisi, in 1922. Salvatore died on July 30, 1948, at his home, 158 Sanford Street, Painesville, Lake County, Ohio, at age 57. His body was interred at St. Mary Cemetery at Painesville Township, Lake County, Ohio. 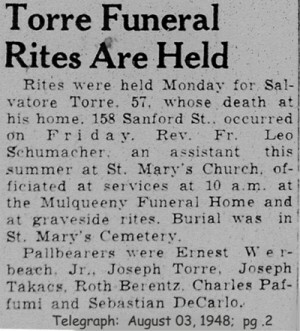 Salvatore Torre immigrated to the United States on April 17, 1913, at age 22, travelling to Boston, Suffolk County, Massechusetts, He was joining his uncle, Michele DiCarlo. Salvatore Torre became a citizen of the United States on February 16, 1926. Salvatore resided at 713 Eagle Street, Fairport Harbor, Lake County, Ohio, when he was Naturalized. Salvatore was employed by the Diamond Alkali Company at Fairport Harbor, Ohio, from 1913 until 1948. Salvatore Torre’s brother, Ugo Torre, also lived in Painesville. 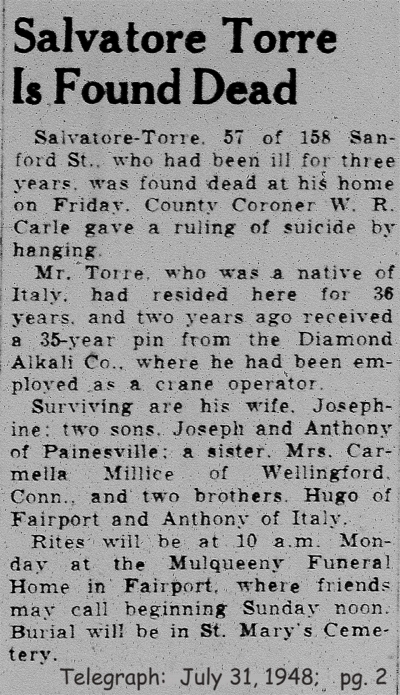 Ugo migrated to Painesville about 1915. 1. Tindera Asunta Torre was born on September 29, 1922, at Fairport Harbor, Lake County, Ohio. Assunta died on June 11, 1933, at Lake County Memorial Hospital, Painesville, Lake County, Ohio, at age 10, of a ruptured appendix. Her body was interred at St. Mary Cemetery at Painesville Township, Lake County, Ohio. 2. Joseph M. Torre was born on November 25, 1923, at Painesville, Lake County, Ohio. He married Giuseppa DiSaia, daughter of Felicantonio DiSaia and Maria Pasqua Zampini, about 1947. Joseph died on June 30, 2003, at his home, Painesville, Lake County, Ohio, at age 79. His body was interred at Riverside Cemetery at Painesville, Lake County, Ohio. 3. Antonio Torre was born about 1925, at Ohio.